Coprocessor 0 (CP0) is incorporated on the CPU chip and supports the virtual memory system and exception handling. CP0 is also referred to as the System Control Coprocessor. Coprocessor 1 (CP1) is reserved for the floating-point coprocessor, the FPU. Coprocessor 2 (CP2) is available for specific implementations. Coprocessor 3 (CP3) is reserved for the floating-point unit in Release 1 implementations of the MIPS64 Architecture and in all Release 2 (and subsequent releases) implementations of the architecture. System software accesses the registers in CP0 using coprocessor instructions such as mfc0 (move from coprocessor 0 register) and mtc0 (move to coprocessor 0 register). For CP0 only, the mtc0 and mfc0 instructions must be used to write and read the CP0 registers. Table 50-23 in the PIC32MZ Family Reference Manual Section 50. CPU for Devices with MIPS32® microAptiv™ and M-Class Cores outlines the CP0 registers found on PIC32MZ devices and is reproduced below. CP0 load/store assembly instructions mfc0/mtc0 support encoding of the Select# to enable selection of all CP0 registers. 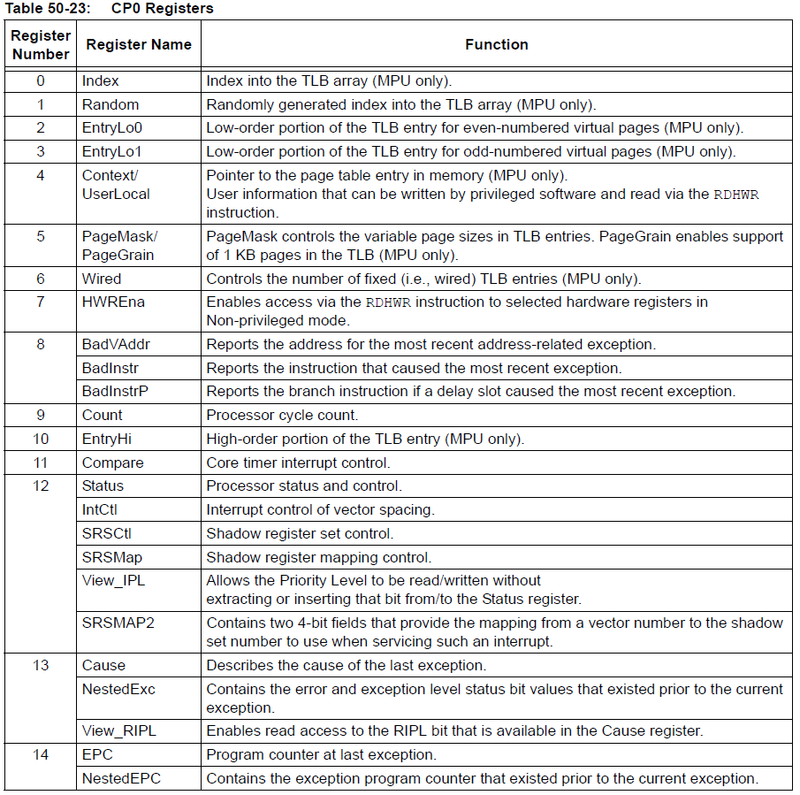 Which CP0 Registers Are Relevant When? You'll need to setup Statusxxx bits to get the CPU into a workable state for the rest of the bootstrap procedure. The first Config register has a few writable bits which you may need to set in order for anything to work. See MPLAB® XC32 Compiler User's Guide (sec 14.3.5) for a discussion on which CP0 registers are initialized by the start-up code as well as their initialized values. On entry, no program registers have been saved, only the restart address in EPC. Handler code must save EPC and Status context for nested interrupt operation. For general exceptions, consult the Cause register to find out what kind of exception it was and dispatch accordingly. Control must eventually be returned to the value stored in EPC on entry. The Status register must be adjusted on exit, restoring the user-privilege CPU state (if required) and re-enabling exceptions respectively. The return-from-exception instruction eret clears the StatusEXL bit (re-enabling exceptions), and branches to the location saved in EPC. StatusIE acts as the master enable for hardware/software interrupt exceptions. StatusIPL contains the current CPU priority level. Software can write to these bits at any time, changing the priority of the CPU. There are five Coprocessor 1 (CP1) registers, also referred to as FPU Control Registers (FCRs), that are used to control the FPU. These registers are 32 bits wide: FIR, FCCR, FEXR, FENR, FCSR. Three of these registers: FCCR, FEXR, and FENR will select subsets of the FCSR, the floating point Control/Status register. The Coprocessor 1 (CP1) registers are only available in devices with the M-Class core. 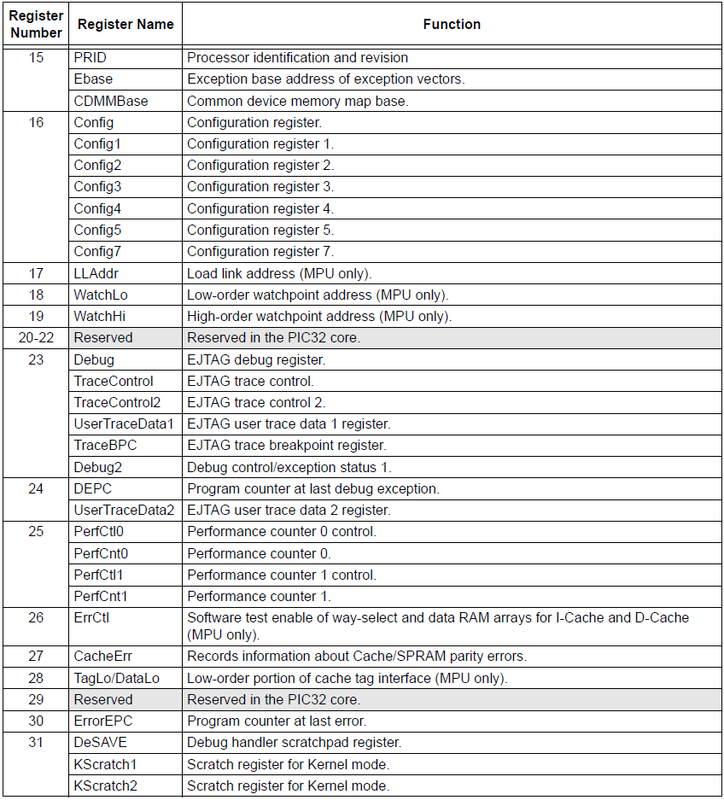 Refer to the “CPU” chapter of the specific device data sheet to determine availability.